Communicate when you're little one is in the tub using this custom illustrated, detailed chart from Babies and Sign Language! Your child can learn to tell you that the water is too hot or cold. 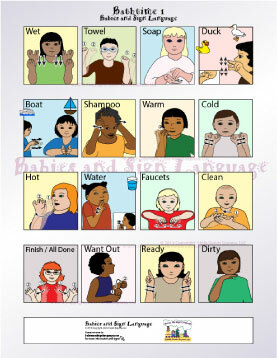 Each panel shows an illustrated child signing bathtime signs in ASL. Each sign is shown using anatomically correct hands.